Former Chelsea goalkeeper Thibaut Courtois has completed his transfer move to Real Madrid on a six-year deal. The transfer deal is reported to be around £35million not forgetting the Croatia international Mateo Kovacic joining Chelsea as part of the transfer agreement. The Belgian international successfully spent seven years with the blues although he was on loan at Atletico for his first three years. He has two Premier League titles to his name, an F.A Cup and a League Cup during his stay with the Blues. Meanwhile, Courtois has one year left for his deal with Chelsea to expire but he now prefers a move to Spain to enable him stay close to his two children. 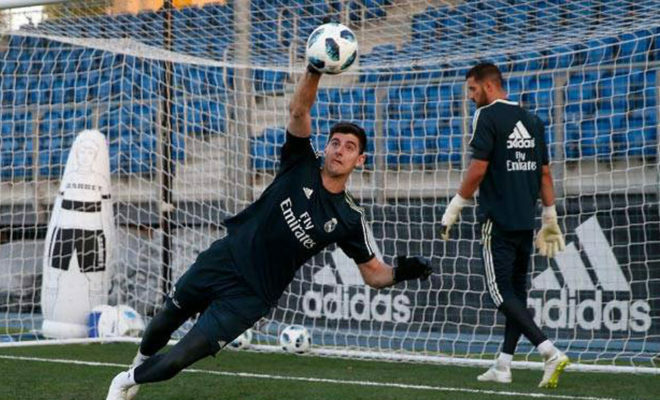 Courtois was presented to the media after completing his medical at Madrid’s Bernabeu. With the media, he expressed his feelings saying Madrid is the best club in the world and he is happy he is finally realising his dream. However, Chelsea have replaced the former number one goalkeeper with the signing of Kepa Arrizabalaga from Athletic Bilbao that is said to be worth £71.6million.